Ages 7 and up. 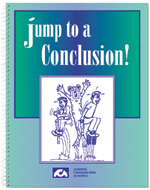 Each reproducible worksheet activity in this wacky language workbook includes a humorous situation with a silly illustration. Students are asked to explain the situation and to create stories about the events that took place.